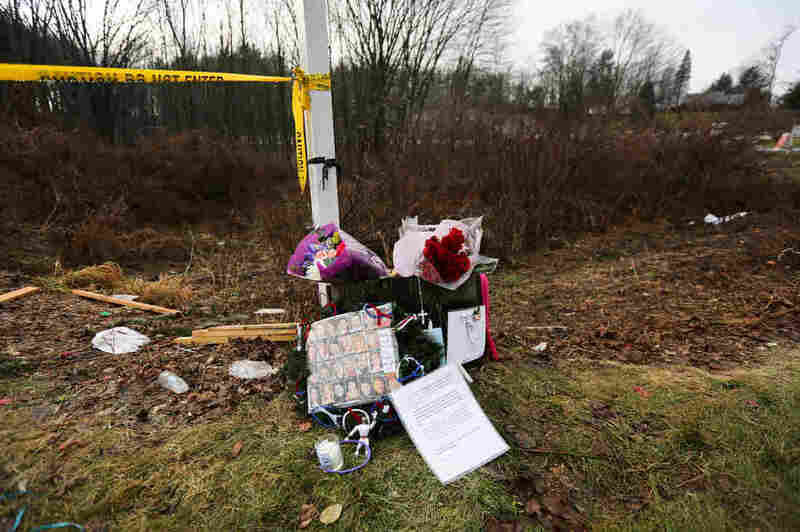 Families Of Newtown Massacre Victims Reach $1.5 Million Settlement : The Two-Way The families of 16 victims sued the estate of shooter Adam Lanza's mother and will receive nearly $94,000 apiece under the deal. The settlement still needs a judge's approval. A small memorial lined a road near Sandy Hook Elementary School about a month after the Dec. 14, 2012, shootings in Newtown, Conn. The relatives of 16 victims of the 2012 elementary school massacre in Newtown, Conn., reached a proposed $1.5 million settlement Monday against the estate of the shooter's mother. According to the Hartford Courant, each family will receive $93,750 apiece from a homeowners insurance policy that Nancy Lanza had on a Newtown home she shared with her son Adam. The lawsuits were filed by the families of 14 victims who died in the school shooting and two who survived. On the morning of Dec. 14, 2012, Adam Lanza entered Sandy Hook Elementary School and shot to death 26 people, including 20 first-graders and six school staffers. He used a Bushmaster rifle that his mother purchased legally and kept in their home. Lanza, who used a handgun to take his own life, had killed his mother prior to the school massacre. "The lawsuits made essentially the same claim — that Nancy Lanza purchased the Bushmaster and kept it in her home, where her 20-year-old son had access to it. State police reports said the Bushmaster was kept in a gun safe that was in a room adjacent to Adam Lanza's bedroom and that he had unlimited access to it. "The lawsuits allege that Nancy Lanza 'knew or should have known that [Adam Lanza's] mental and emotional condition made him a danger to others.' "
The proposed settlement still needs to be approved by a judge, according to The Wall Street Journal. The mass school shooting shocked the nation and sparked a heated political debate over the country's gun control laws that continues today. Member station WNPR in Connecticut reports that the state's two Democratic senators are backing legislation that would require gun dealers to wait until background checks are completed prior to selling a firearm. Currently, WNPR says, "federal law allows dealers to sell a gun after 72 hours even if a background check is still pending."